Built as the signature attraction of the new Cred Street area of the park, upon entrance guests were split into small groups of around 20 and were then led around what was essentially a large fun house before being shown into a theatre where your journey was replayed to you, having been filmed in secret during your time in the attraction! Once they'd been batched into groups and met their guide to the attraction in the debrief room, guests were then let loose into the fun house section of the ride filled with various interactive elements; from the first sound/pump room filled with sound effect buttons to press and games to play, through the attractions winding corridors and past a classic shadow wall element, before finally crossing over a choice of rope bridges spanning an area lovingly known as the fondue pot. Slides (or a more sedate corridor for the adults) led guests from the fun house into the final element of the attraction, where guests entered a theatre to watch their exploits in Nickelodeon: Outta Control, which had been filmed by secret cameras throughout. Having completed your trip through the attraction, guests were let out into the onride photo kisok, from which they could choose if they wanted to exit through the Slurp and Burp Cafe or Off The Shelf, the attraction's shop. If you were to sum up Nickelodeon: Outta Control in one (hyphenated) word, ill-fated would do the job nicely. 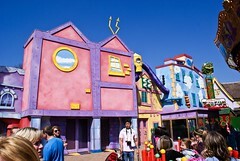 Originally conceived as the Nickelodeon Mind Maze, the attractions was intended to open for the 1996 season as a replacement for the Doll Museum that had closed in 1995, however technical issues delayed the attraction into the following season. The attraction eventually received its grand opening on the 15th June 1997, which was televised on Nickelodeon and was part of a launch event that saw scores of extra games available to guests throughout the park over the opening weekend. Outta Control opened to mixed reviews, generally seeming more to baffle and confuse guests rather than entertain as it sat awkwardly between being a fun house, a show, a walk-through attraction and an extended advert for a TV channel, whilst not quite mastering any of these elements. 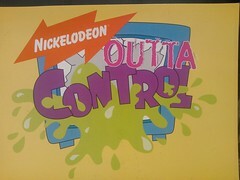 Needless to say Nickelodeon: Outta Control did not last very long at the park and closed at the end of the 1998 season. It is generally considered that its fairly low throughput combined with low guest satisfaction, high running costs and the fact the attraction did not seem to gel together very well combined to put an end to the fun house. The decision to permanently close Outta Control seems to have come very late in the closed season leading up to the 1999 season, as it was only midway into 1999 that the Frog Hopper was parachuted into the park's line-up as a replacement, positioned right outside the shuttered attraction's front doors, an area the ride occupied for many years, using Outta Control as a glorified backdrop. But the story didn't end there... indeed, Nickelodeon: Outta Control still exists within the park to this very day shuttered behind its façade that dominated Cred Street, much as it does Cloud Cuckoo Land today. After its closure, Outta Control has been left SBNO for over 15 years with much of the fun house element of the attractions still in situ today, making for some interesting Behind the Scene Tours over the past few years. Attached to the side of the Cred Street Theatre, the abandoned attraction soon also became a storage area for the theatre and was often used as green room for the entertainment department as well. In 2007, just over 10 years after the attraction had originally opened, the general public were once again able to take a peek within the attraction during the original Scarefest event, which saw the Slurp and Burp Cafe and Off the Shelf reopen as Patch's Pumpkin Playground, a small-scale 'kids club' style attraction. It is thought that the original intention had been to open up the Outta Control's fun-house element for the attraction as a children's spooky walkthrough, though this did not make it through to the event's final line up. Patch's Pumpkin Playground was not a well received attraction and did not return for subsequent Scarefests, leading to Outta Control once again becoming fully SBNO. More recently the entrance of the Slurp and Burp Cafe was converted into Sid's Snowball Toss, as part of the Ice Age development of 2012.